For the last two years I have been in Portugal during the PEN World Voices Festival, but this year’s schedule, from mid-May to the end of June, gave me the opportunity to attend. Years ago, I served as a festival blogger, one of the high points of the year for me, but much of the festival has changed over the past several years, and we bloggers don’t get the free run of the festival as we used to. On the other hand, living in New York City rather than Albany has allowed me to pick and choose from the entire schedule instead of rushing back for my weekend commitments upstate. The panelists, from left, Susanna Reich, Raúl Colón, Duncan Tonatiuh, Manuel M. Martín-Rodríguez, Carmen Tafolla, Jesse Gainer. Another big change is that each year PEN chooses a country as its festival focus. This year, the country is Mexico, and the panel sponsored by the PEN Children’s Committee on Tuesday night at Dixon Place highlighted the Tomás Rivera Award, given to outstanding children’s and young adult books that portray the Mexican-American experience. Unlike the Pura Belpré Award, given by the American Library Association, this award from the Texas State University College of Education in San Marcos, where Tomás Rivera graduated, focuses on the books rather than on the author or illustrator’s heritage. 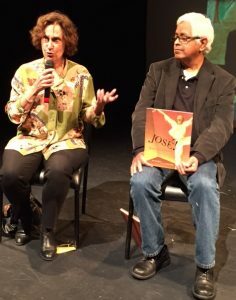 Thus, one of the panelists was our own PEN Children’s Committee former co-chair Susanna Reich who, along with illustrator Raúl Colón (who is Puerto Rican), won the Tomás Rivera Award in 2006 for their biography of José Limón, José! : Born to Dance. The other panelists were multiple award winners Carmen Tafolla (author of The Holy Tortilla and a Pot of Beans and What Can You Do with a Paleta?) and author/illustrator Duncan Tonatiuh (Separate Is Never Equal: Sylvia Mendez and Her Family’s Fight for Desegregation, Pancho Rabbit and the Coyote: A Migrant’s Tale, and Diego Rivera: His World and Ours), award committee chair and Texas State University College of Education in San Marcos faculty member Jesse Gainer, and scholar Manuel M. Martín-Rodríguez, who served as moderator. Martín-Rodríguez began with a summary of Rivera’s life and philosophy. According to Rivera, there are three keys to becoming a productive part of the community: remembering, discovery, and volition/agency. These keys informed the discussion that followed. 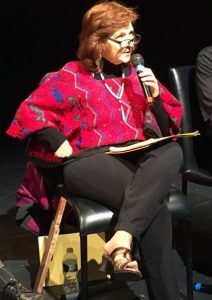 Carmen Tafolla speaks. At her side is the paddle administrators used to hit children in who spoke Spanish in school. Tafolla is the author of picture books, poetry, and short stories; a storyteller and performance artist (as she showed us the following night in a stunning performance at the Nuyorican Poets Cafe); and an activist. She began by showing the audience a wooden paddle with holes drilled into it. This paddle was used to hit children — herself included — who spoke Spanish instead of English-only in their Texas schools. The holes made the paddle move faster before striking the child’s rear end. “We were the spoils of war,” Tafolla said, referring to the wars in 1836 and 1846-48 in which Mexico ceded its northern lands and all of the people living there to the United States. When she was growing up in the 1970s, books portrayed her people as “dirty Mexicans,” if they portrayed them at all, and she and her classmates attributed Mexican ancestry to popular culture figures such as Charles Bronson so they’d have someone with whom to identify. But even though the publishers refused to publish stories by writers of Mexican heritage, they had an oral culture, folklore, and poetry, and many of her peers bought printing presses to put out their own newspapers and books. 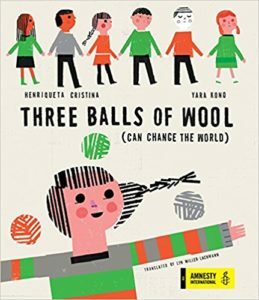 Tafolla cited the Tomás Rivera Award as one of the things that opened up the world of publishing so children could see themselves reflected and celebrated. Susanna Reich and Raúl Colón show off their award-winning picture book biography José! Born to Dance. Colón talked about the connections between Mexican and Puerto Rican culture and the immigration experience that he shared with Limón, which involved having to learn a new language. Like Colón, José Limón first wanted to be an artist, but things didn’t work out for him — his preferred style was out of fashion and the teachers felt others were more talented. That’s when Limón discovered dance as a means of artistic expression. Colón had to do a lot of research about dance, the various positions and moves so that he could portray them accurately in the picture book. Tonatiuh cited the CCBC statistics on the underrepresentation of Latino authors, illustrators, and main characters in children’s literature. He pointed out that awards like the Tomás Rivera and Pura Belpré (which he also won for Separate Is Never Equal) encourage the publication of books by and about Latinos and help people to find these books. He has visited many schools and seen what children do to extend the books, such as writing plays based on Pancho Rabbit. He finds this energizing for him as a book creator as he sees first-hand how much these books mean to children who share his heritage and experiences. As Gainer explained, Tomás Rivera, the author of Y no se lo tragó la tierra / And the Earth Did Not Devour Him, saw literature as a tool for collective decolonization. And the paddles may be gone, but the problems remain — too much testing and not enough reading, inadequate representation, censorship in Arizona and elsewhere. Gainer cited the “volition/agency” portion of Rivera’s philosophy in highlighting the community activities surrounding the award. As part of the awards celebrations, young people interact with the winning texts through their own artwork, p0etry, and performances. Children and their elders participate together. And since the events are held on the San Marcos campus, children see the university as a path for the future and a hospitable place. 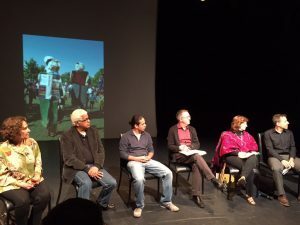 Gainer would like to increase the exposure of the awards, and the activities, beyond central Texas, and he saw his appearance at the PEN World Voices Festival as a means of doing this. PEN Children’s Committee co-chair asked about book banning like the removal of books that were part of the Mexican-American Studies program shut down by the state of Arizona. Tafolla’s books were among those removed, and she observed that the banners had never read the books. But the students in the Mexican-American Studies program got excellent grades and went to college at a very high rate; the shutdown of the program represented the state’s effort to undermine this achievement. 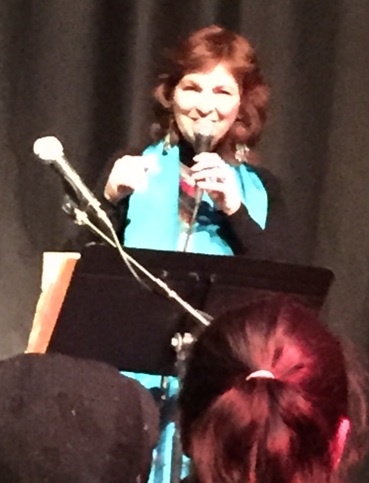 Carmen Tafolla performs the following night at the Nuyorican Poets Café. A third question had to do with Mexican-American parents’ support (or lack of support) for their kids pursuing careers in literature and the arts. The panelists didn’t see that happening. Based on the participation of parents, grandparents, and other relatives in school and community events around books and reading, they see very strong support. “We have plenty of writers,” Tafolla said. “The writers aren’t having the doors open for them.” A follow-up question had to do with how publishing may change when Latinos are the majority in the United States. Reich said Latinos are already a majority in California and Texas, but it’s not “flicking a magic switch” among New York publishers, and we need to keep the pressure on the publishers. The final question was about the impact of awards on bringing about change among the corporate publishers. Tonatiuh has seen more celebration of diversity; his large publisher is more open to diversity today than he has experienced with publishers in the past. He said everyone can support change by buying diverse books and writing publishers in support of those books. Tafolla agreed. Population numbers won’t do it because we don’t live in a democracy but an oligarchy, and we have to infiltrate the system. We have to fight on the terms that exist, which means supporting diverse authors by buying their books. Colón speculated on the impact of Lin-Manuel Miranda’s hit musical Hamilton, and said that one day, this will happen to books. Change can come very quickly if we work together to make it happen. Sounds like a great festival. Carmen Tafolla’s experience is sad. I agree that we need the support of the small presses.